This format book and CD is just perfect. 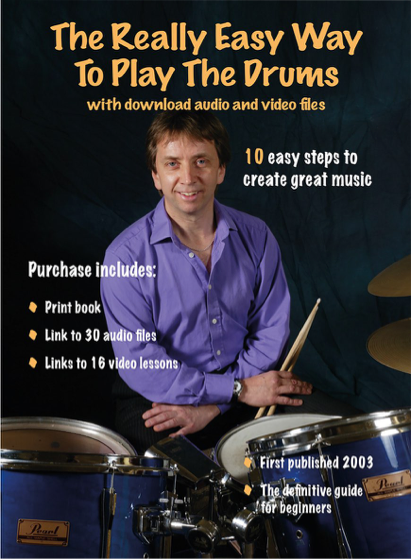 Steve's first book, although for beginners, still surprises the experienced drummer. You see patterns written then, when you hear them on the CD, it opens up all sorts of understandings leading on to new ideas. It must be a real revelation to a novice, and the quickest way to learn, because, once you hear it, it's just a question of practice for speed and smoothness (and from the tracks, it would seem Steve's a pretty smooth drummer!). The book is well laid out, too, and well structured with a coherent progression. I can't recommend this book enough for beginners and for experienced drummers who want or need a refresher course. Five stars and worth every one of them! As a learner drummer, I wanted an easy to read, step-by-step guide to the basics and a few styles. "The Really Easy Way" was just perfect! It's so clearly set out and encouraging that I found myself improving with each page. Some drumming books so complicated that its off-putting, but this takes you through each step simply - fully explaining each exercise. It's like a course of lessons all in one book! - A must for every eager drummer! “Thank you so much for your prompt and efficient service - a very rare thing these days.” Marcus Dodd, Dorset.